I recently travelled to Cornwall, for what was an extremely special weekend, and one I’ll never forget. But that’s not what this post is about. This post is about the last time I went to Cornwall, a little over a year ago. 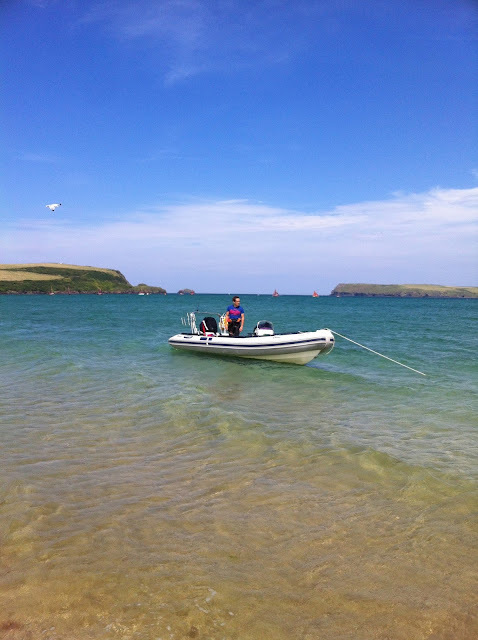 I had never been to Cornwall before last year, when I was very kindly invited down to visit a friend. It was to be a boys’ weekend. We were staying in North Cornwall, and were lucky enough to have access to a boat. We were also lucky with the weather, in what must really be one of the most beautiful places in the whole world. People are rude about England, calling it drab and unexciting. Fine, let them miss out, I say. Because this is truly, truly stunning. We took the boat out, and went to sea. 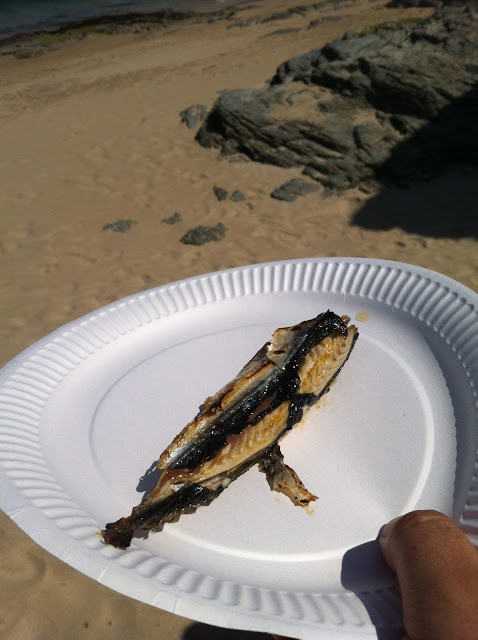 We had stopped at a petrol station en route, and picked up a bunch of mackerel lines for a few quid each. 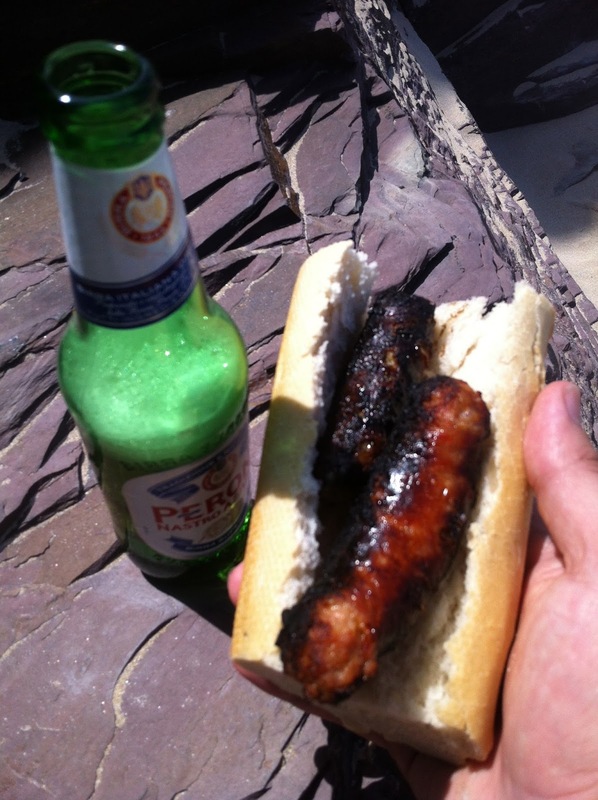 We cast them over the side and sat back, popping the cap on a couple of bottles of Peroni each. Within a few minutes, we felt tugs at the lines, and hauled them skywards, plucking out of the Atlantic Ocean fresh, rainbow-glittering mackerel. 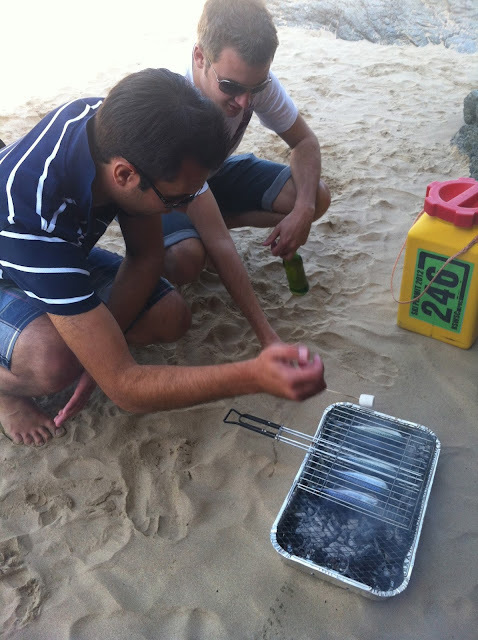 Then it was back to the beach, and time to set up the mini barbecue. This was my actual view as we ate our lunch. 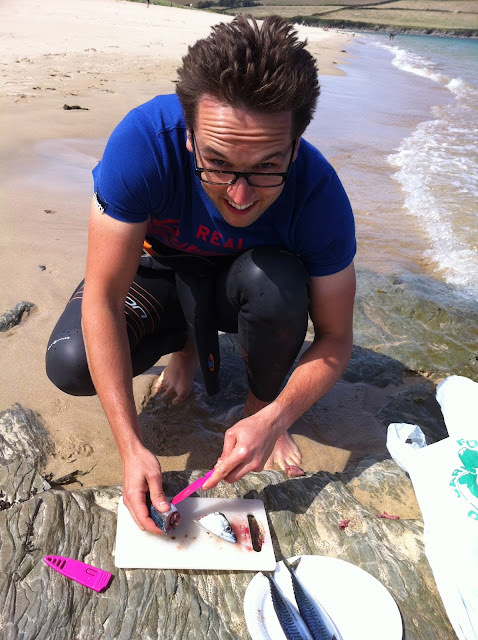 Whilst some of the boys slaved away with the charcoal and embers (read: argued about how best to get it going, or, as the picture demonstrates, spent more time mucking around with marshmallows), Ben the Boat Driver went off to gut the fish. And even sooner they were cooked. And they were truly, wonderfully fantastic. Now, that’s what I call fresh and locally sourced food. Fresh? 30 minutes from ocean to plate. Food miles? Not even one, I reckon. And, of course, just in case we didn’t catch anything (and we hardly caught much), we grabbed a bunch of local sausages from a lovely Cornish butcher with anamazing array of different bangers. All in all, a very special day out. Ever such a quick post today. There is, I am told, a pizza revolution sweeping the Capital at the moment. Well, thank God for that. Because I bloody love pizza. Adore it. So a quick shout out to the Well KneadedWagon, and their firebread pizza. It’s absolutely bloomin’ marvelous. I cam across it some time ago now, but it’s well worth following them on Twitter to keep an eye on where they’ll be stopping next. The plan is simple – albeit brave (in my view! 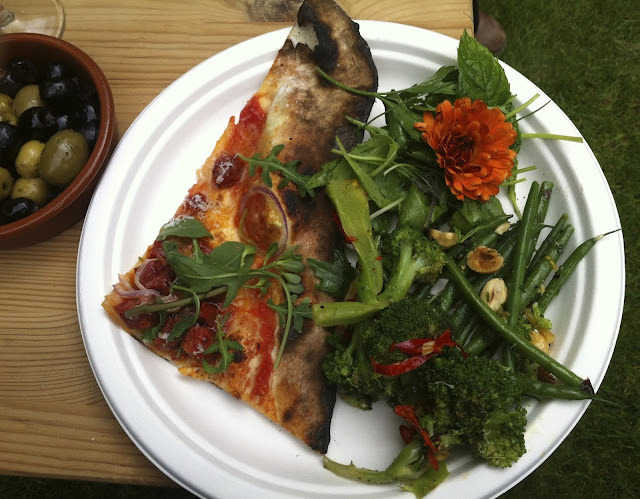 ): build a massive, wood-fired oven in the back of a clapped out vintage Citroën H Van, and cooking classic, authentic pizzas out of the back of it. And, you know what? It works. OMG, it works. So, if you come across them, don't hesitate just chow down. Ketchup or Brown Sauce? it's a racial thing. I remember during my time up in Scotland, in Edinburgh where I lived for five years, there was one question you had to take extreme care answering. Late at night, in a chippy, ordering your post-pints munch, the server would put the question to you: "salt and sauce, pal?" Any slight sign of hesitation, and you were sunk. It was as simple as this: there's only one acceptable chip condiment in the 'burgh - Chippy Sauce, a sort of watered down vinegar sauce. And, you know what, it wasn't too bad. I understand that it's only an Edinburgh thing. Other places are more broadminded about their condiment selections. Leading some people to interpret a refusal to provide good old Tommy K as racial discrimination. No, really. This man thinks it's a racial issue. OMG. Here's the full news story, at the Edinburgh Evening News. Bank holidays. Love 'em. Who doesn’t? GrubsterGirl and I tend to try to manage at least one day of a weekend with just the two of us, holed up in the flat with papers, a jug of coffee and preferably something to eat. This weekend has been a busy one, so thank goodness it was a three-day-er. To celebrate the extra day, this morning we got up bright and breezy to make my favourite brekkie: French toast, bacon and maple syrup. It’s a strange combo, but far from an usual one. In the States, they’d barely think twice about lathering salty, fatty, streaky bacon with lashings of syrup; in England we turn our nose up at the idea. I remember the first time I tried it – in an underground, all-you-can-eat breakfast bar in New York. 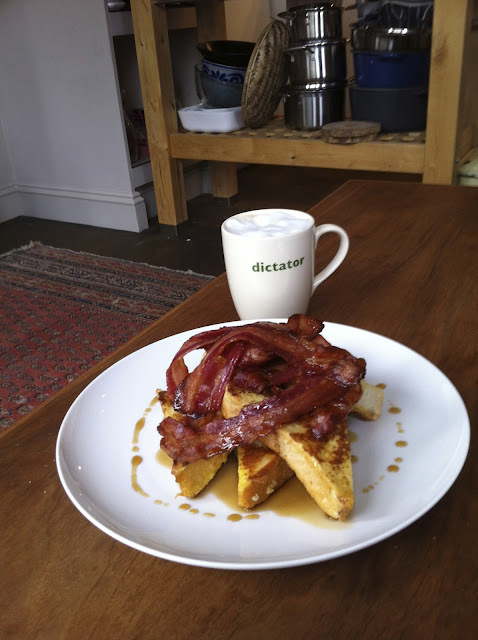 At uni, up in Edinburgh, there was a great place called Favorit* that sold bacon rolls, coffee, Belgian beers, and, yes, French toast, bacon & maple syrup until 3.00 am, making it the perfect post-pub stomach filler. The mix of salt and sweet is a fantastic one – and much more common that people think. Salt and sweet popcorn? Salt chocolate? Salted caramel? It’s everywhere. And it’s great for breakfast – especially if you’re suffering a little from the night before. 1. 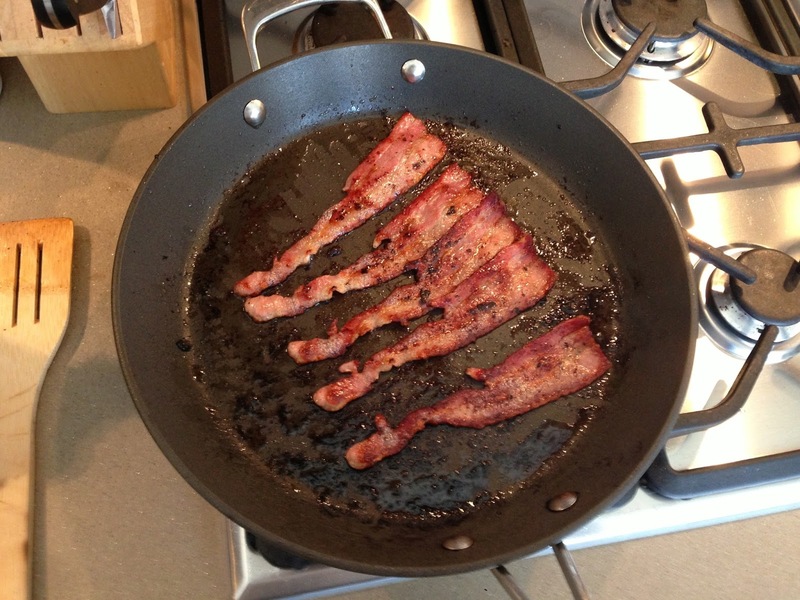 Get that bacon in the pan and start it frying. Or stick it in the oven if (a) you remember to pre-heat it; and (b) you’re feeling healthy. I did neither; I’m pretty disorganised and I kinda feel that, with this dish, if you’re cooking it then it’s a little late to be worrying about health concerns. 2. Carve your bread into nice thick slices. You’re going to want the bread to soak up as much eggy-goodness as possible, so big chunks helps. Thick, like the best part of an inch. Slice diagonally to form triangles. About one and a half slices per head. Or two if you're a troffer. 3. Turn the bacon. You want it nice and crispy, American style. That’s why I’m stipulating streaky bacon, not back. Sure, back bacon tastes better, but here you want the streaky stuff. Some supermarkets do Americanstyle bacon which is really, really thin, a bit like pancetta, and about 50% fat. Go for this for the truly authentic experience, it actually aint that bad. 4. Crack your eggs in a bowl and whisk them up with a splash of milk. A bit like making scrambled eggs, but without the pepper and cream. So not that much like making scrambled eggs, but you know what I mean. Some folks like to add cinnamon at this stage to make it even more all-American. I didn’t, but I won’s judge you too much if you do**. 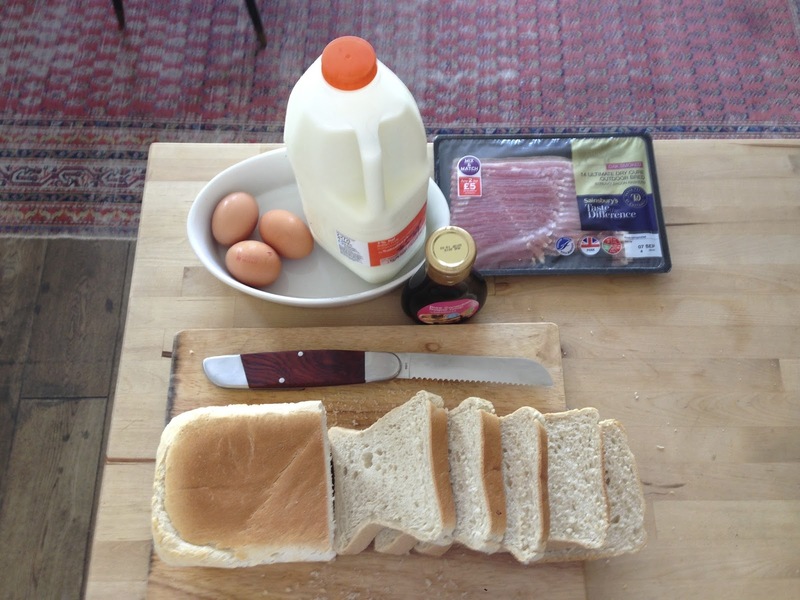 Once mixed, lob in some slices of bread, turning after a few minutes so that both sides have soaked up lots of egg-mix. 5. Once all the bacon is crispy, remove from the pan and leave on a piece of kitchen towel to allow some of the fat to be soaked up. If it don’t look like this, do it a bit longer. 6. Wipe down the pan and throw in the eggy-bread. Cook it for two to four minutes, then flip it. If it shows any kind of resistance or stickiness to the pan when you’re flipping it, give it a bit longer – it aint done yet. When you do flip it, check that the underside (ie. the bit that’s been a-cookin') is a lovely dappled brown. If not, give it a bit longer. It should look a bit like this. When both sides are cooked, stand them up on their sides to brown them. 7. Remove from the pan. Stack up, photograph, resist the urge to scoff them all, and Instagram that thing. 8. 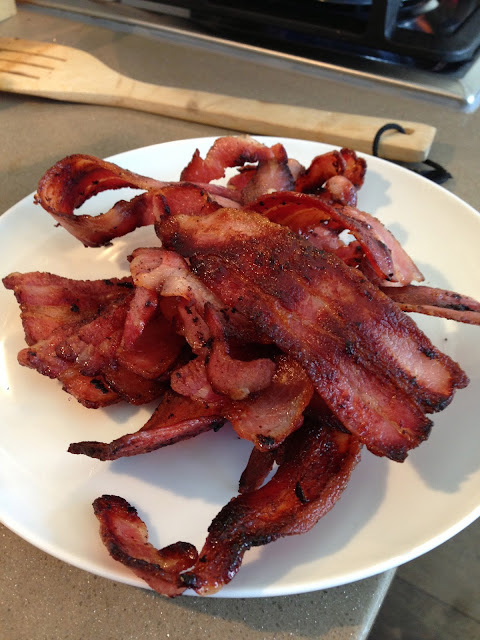 Slice again into smaller triangles, arrange bacon, drown in maple syrup, serve with hot coffee and cold orange juice. 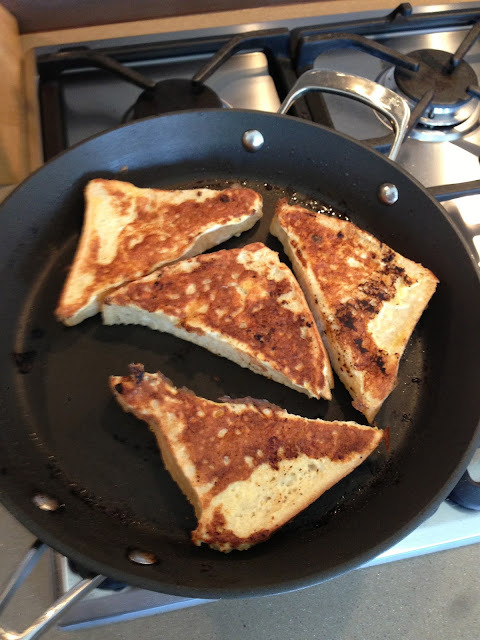 Of course, if you're feeling super healthy (weirdo) but still want french toast (contradiction in terms) then why not try it as GG had a little while ago - forgoing the bacon and using summer fruits instead? * I loved it as a student, but that was many years back now, and in any event our standards were probably more limited – I mean baked beans on toast was considered a delicacy if one sprinkled Worcestershire sauce over it. One way or another, I notice the reviews online are now pretty poor. So who knows. Al-Desko Dining: Because having to work through lunch shouldn’t mean you have to eat the same old tired damp sandwich day after day until the end of recorded time. I love pasta. Always have done. It's my go-to dish, my emergency have-to-eat-quickly dish, my oh-no-there's-nothing-in-the-house-to-eat dish, and my all-time favourite, ultimate comfort food. There's something so incredibly satisfying and hearty about it, especially when covered in a mountain of rich, meaty sauce and salty parmesan. Yum yum yum. So when I learned that Gino D'Acampo (famous, perhaps, for his stints of This Morning and I'm a Celebrity…) was opening up a new fast-food pasta bar within spitting distance of my office, I got very excited. Earlier this week I headed out to My Pasta Bar to see what the fuss was about. The concept is actually refreshingly simple: there's a range of pre-packaged foods, all fresh Italian staples, like pizza focaccia or arancini (deep-fried risotto balls of heart-clogging goodness), as well as a range of pasta-and-sauce options – five for carnivores, five for veggies. But you're not tied into anything; you are totally free to mix-and-match your choices – carefully selecting your favourite style of pasta and combining it with the most mouth-watering sauce you can find. My meal of choice: Penne Bolognese. Let's start with the important thing here: it tastes great. Rich, meaty, tomatoey goodness. I don’t know about the authenticity of this – then again, there's real controversy over the 'authentic' Bolognese recipe – but it's a tasty nevertheless, and that's what counts. If I was going to make one complaint it would be this: I like my pasta al dente, with a good amount of bite, and this was lacking. But I would modify that with two things: (a) it's hard, if not impossible, to do pasta as fast-food and keep it crunchy. Would I rather miss out of fast-food pasta than have it more cooked than to my liking? No. And (b) GrubsterGirl tells me that I basically eat my pasta raw (I disagree, but hey). So perhaps, at least on this one tiny detail, I am biased. Back at My Pasta Bar, it gets better: it's totally customisable. By which I mean that, in addition choosing your pasta and sauce, you're also presented with a tray of little dinky pots of Stuff. These include parmesan, basil oil and chilli oil. All good, all tasty, and a lovely little touch. One last thing: it was enormous. There's no way you don’t get value for money, at least in terms of quantity. I wanted to hide under my desk and have a little nap. Price? Decent, I reckon. All in, including a blood orange San Pellegrino (the yummy, ever-so-authentically Italiano, often shockingly expensive soft drink), the total damage was £6.75. So not an everyday experience, but very good value for what you get. What on earth is Flesh & Buns? "…the new Izakaya restaurant from Bone Daddies"
"An izakaya (居酒屋) is a type of Japanese drinking establishment which also serves food to accompany the drinks. They are casual places for after-work drinking." I'm still no closer to the truth. What's more, even having been there, I can’t give you a precise answer. One thing I do know about Flesh & Buns is that it is achingly trendy. The place, a converted wine cellar (or somesuch) located under the Donmar was relatively quiet when we got there – a civilised 8 o'clock – but absolutely heaving by the time we left, a couple of hours later. It's low lit, loud music, even louder chatter, and long, room-length tables stretching from a cocktail bar at the front to a semi-open plan kitchen at the back. There are a few smaller tables, which one can book for parties of six or so, dotted around the periphery, but the main action seems to take place on the long, high tables. GrubsterGirl and I kicked off proceedings, in our usual way, with a couple of rounds of cocktails. To start, she had a Lychee and Pomegranate Martini, which was lovely, sweet and tasted of its signature components. My Shiso and Pink Peppercorn Julep was nice enough as a drink – I enjoy a julep, as it happens, so can't really complain – but tasted of neither shiso (a Japanese herb, and that big leaf sticking out the top of the picture) nor pink peppercorns, which was a touch disappointing. Never ones to leave a job half done, we went in for a second round. GrubsterGirl had the Peach Blossom Sour and I had the Nikka Cherry Sour. Both were yummy, so no complaints there. Later on, however, GrubsterGirl also had a Frozen Yuzu Margarita (to make up for a screw up of the order). Now, I've had to check what yuzu is (it turns out that it's a small, oriental citrus fruit used heavily in Japanese and Korean cuisine – who knew? ), but it tasted to me just like a normal, frozen margarita. Which is a bit of a shame. And it wasn't helped, I don’t think, by having been squeezed out of a bloody great big ice churner. Food-wise, they offer a batch of starters, some hot, some cold, and then a list of 'flesh and buns'. These are standard main dishes, each accompanied by dim sum steamed buns and some salad. We started with the mixed sashimi and tuna tataki, sharing both. Really top notch dishes, I loved both. The sashimi was as fresh as it needs to be, and offered a nice mix. The tuna, however, was first class. Really nicely put together, well charred on the outside, and accompanied by a flavoursome sauce that avoided just being soy and spice. The main courses started well. The flat iron steak with BBQ sauce, accompanied by pickled shimeji was divine, and sat nicely in their little buns. GrubsterGirl chose the crispy duck leg with sour plum sauce, accompanied by turnip pickle. This was slightly disappointing. It felt like a dish without much effort: simply roasted duck leg, allowed to speak for itself rather than being seasoned, spiced and flavoured. So all good so far? Well, kind of. The food was good, the drinks decent, but the service was shocking. Slow and often wrong. Things failed to arrive at once, meaning cold buns being eaten with hot flesh – less than ideal. I wondered at one stage if the staff struggled to hear in the noise, but one way or another it was a little poor. It wasn't cheap, either: the bill came to £90 for two people (after they had taken off the things we weren't supposed to be charged for…) without pudding. However, my real gripe with Flesh & Buns is how tight they are with the buns. Because you get two. And that is it – no matter how many dishes you order. Which means that you simply have to order more, and they know that – so any dish marked as £15 is actually £17.50 because you have to factor in ordering more buns. Given that the cost of producing those little suckers must be minute, that sort of attitude just feels a little cheap. Which is a shame, because otherwise I reckon I'd have liked the place. Al-desko dining: Reviews of the busy city worker's lunchtime treats. Making sure that working lunches are more than just a supermarket value combo. Directly opposite the Ye Olde Cheshire Cheese, just off Fleet Street, there used to be a little sandwich shop. You know the kind, run-of-the-mill City place with steel dishes containing mounds of egg mayonnaise and tuna sweetcorn and coronation chicken, filling baps and baguettes as fast as the City boys could order them. I'm not judging especially – I never went there – but I can't say I noticed it had closed down. I did, however, notice what sprung up in its place. Pilpel have been operating quite successfully since 2009, with three branches elsewhere in the City, dolling out prodigious great quantities of grape-shot sized falafel to the monied masses in St Pauls and Spitalfields. The secret of their success? The food's bloody marvellous. Let's start with the falafel. Eight hefty chunks in each bowl – you can buy it by bowl or pitta (the bowl, with its accompanying salad mountain is by far the better bet, both in terms of meal and value for money). It's crispy on the outside, and soft, moist and warm on the inside. I'm no great falafel-expert, but this tastes good to me. This tastes like what I think falafel should taste like. So often it's dry, powdery, flavourless fried mush. Here it feels carefully crafted, assembled, served. Fantastic. Then there's the salad, and I think this does deserve a little bit of time. Because in each bowl you get: cucumber, tomato, white cabbage, red cabbage, lettuce, marinated chickpeas, gherkins and pickled chillies. Then, depending on what option you go for, there's other stuff. We went for the Mediterranean Falafel Meal and were rewarded humus, tabbouleh and fried aubergines (the latter or which were so wrong and yet so very, very right). All of it's top quality, and tastes amazing. Then, as if you don't have enough on your plate already, the whole thing gets drowned in lashings of tahini and chilli sauce. There's two options of chilli sauce – green and red. Green's hotter, but has a far more interesting flavour. Oh, yeah, you also get a pitta bread with it all. FFS. Price-wise, it aint cheap – but good, fresh food seldom is and this is the City, isn’t it? £5.25 for the meal, which sounds on the cheap stuff, but honestly I can’t think of a place nearby where I get quite as much food for my money. On that note, it's not the best desk lunch I can imagine for two very good reasons: (a) it's not a tidy meal to eat; and (b) you're going to want a siesta afterwards – by which I mean a nap of several hours to digest it all. Still, totally worth it. PS: If you're passing by and you see a dude hanging outside Pilpel handing out samples, do not just walk on by. Grab a falafel ball, give it a chilli and tahini dunk, and grub up. Last night some friends and I hit the Great British Beer Festival at London Olympia. I heartily recommend it. Especially if you like beer – by which I mean the flat, cloudy brown stuff, not the cheap, fizzy yellow stuff. Basically, £10 gets you entry to a massive big room full of – quite literally – thousands of different beers to try. I'm not going to list out each and every beer – apart from anything else, I can't remember them all. In total, I must have tried about a dozen and tasted many more. At the entrance you're asked to buy a glass for £3, which you can either give back (for your money back) or keep. The glasses are marked: pint, half pint, one-third pint. I strongly recommend buying thirds only – a friend tried halves before realising, very early on, the error of his ways. After all, you don’t want to limit yourself to the different varieties you can try! But the star of the show, the absolute humdinger of a beer, was this one. The Starr Hill Brewing Co.'s Bourbon Barrel Cryptic Imperial Stout. Hailing from Crozet, Virginia (their address is the fantastically named "Three Notched Road"), this epic brew is aged for two years in old bourbon barrels – a process that adds 3% ABV to the brew, bringing it up to a teeth-sucking 10%. At that strength, you're not going to want to drink it by the pint – not that you could at the festival, they only serve it by the third – but that's no problem because it's so rich and beefy that you wouldn’t want to. It's treacly, caramelly flavours are perfectly matched by the a smooth, thick consistency. I think I'm in love. American craft beers are undergoing a real renaissance at the moment – and rightly so, if this drop's anything to judge them by. Tragically, all the Googling in the world has left me unable to find this particular brew in the UK, but if anyone knows of it, please let me know! Sure, there's an eclectic mix of people, shall we say, ranging from the city boys with their reluctant girlfriends (who look ever so slightly lost and confused) to the beard-and-cardigan-and-socks-with-sandals brigade, who are deadly serious about this thing. But it's still a great event – a perfect night out with the boys. Also, BBC News tells a sad tale this morning. In some parts of the country pubs are closing at a rate of 22% per year, which is just frightening. Drinking more beer is apparently the thing to do – CAMRA actually says so – so you should see visiting the Great British Beer Festival as your patriotic duty. Controversially, I rather enjoy a maraschino cherry with an Old Fashioned. Plenty of people object, and I understand that – I can't imagine there's anything particularly traditional about the provision of a piece of candied fruit in a drink like that (to the extent that there is anything traditional at all to an Old Fashioned…). But there's something incredibly retro, something that makes you actually feel like Don Draper with a kitsch cocktail cherry floating in your manly bourbon. Or so I feel. The problem is that the maraschino cherries on the market are, frankly, disgusting. They get even more disgusting if you ever find out what goes into making them. So I wanted to have a go at making some of my own. First step was to visit Maynards Pick Your Own Fruit Farm in East Sussex. The recipe calls for fresh morello cherries, which are an absolute pain to get hold of. I think they're probably essential - despite various peeps on t'internet saying you can make these puppies with any old cherries, I can't help thinking that, what with all the sugar and the sweetness of the liqueuer, you're going to want something to balance it out, and sour morello cherries are probably a good start. Maynards had some so we went a-pickin'. Also, the folks there are lovely, the fruit is great value and there's something wonderful about hand-picking the fruit that you're going to eat. Next was to find a recipe. This one came from Cupcake Project. I've translated the recipe from US measures to rough English measures. First, pit all of your cherries. Buy a cherry pitter for this, there is really no other way. Also, for the love of God, wear an apron. These little blighters are squirters. As you can see. Next, heat the water and sugar together in medium pan. Remember that you're gonna have to get all your cherries in here too, so make sure it'll fit them all. Once the sugar has dissolved thoroughly, add the cinnamon stick and vanilla essence and grate in a little nutmeg. The bring it to the boil. At this point you're going to be fretting that there won’t be enough liquid to cook the cherries in. Don't fret so, it'll all be good. Because now you're going to add the cherries and be amazed that the amount of liquid is actually about right. See? Simmer those cherries for five minutes. Actually, if I did this again, I'm not sure I would. I used very ripe cherries, and my end product is a little… soft for my liking. So next time I think I'll just add them to the pot and then immediately turn the heat off at this stage. Whatever you do, you need to turn the heat off once you've done it. Once it's cooled a smidgen, add your maraschino liqueur. Once the whole mix has cooled a little, plonk it in the jar. I sterilised mine by washing it thoroughly then rinsing with boiling water and placing, upside down, in an oven at 150°C for 15-20 minutes. Hope that works. Once all that's done, stop taking artsy photos, seal it up and put it in the fridge for a few days. Then mix an Old Fashioned / Manhattan / any other cocktail, and voila. Oh, also, I had some surplus syrup left. I also had a few fingers of bourbon left that I had intended to save for experiments involving making bacon infused bourbon, until I realised that this was a terrible idea. So I mixed the spare syrup and the bourbon together, and one day soon I'm going to attempt to recreate the fantastic Cherry Manhattan then make at Lost Society. I'll let you know how it goes. The whole Mad Men, 1950s / 1960s New York plush thing has pretty much been done to death already. But that's not to say that bars aren’t still going to try it, nor is it to say that they aren't (from time to time) going to get it bang on. 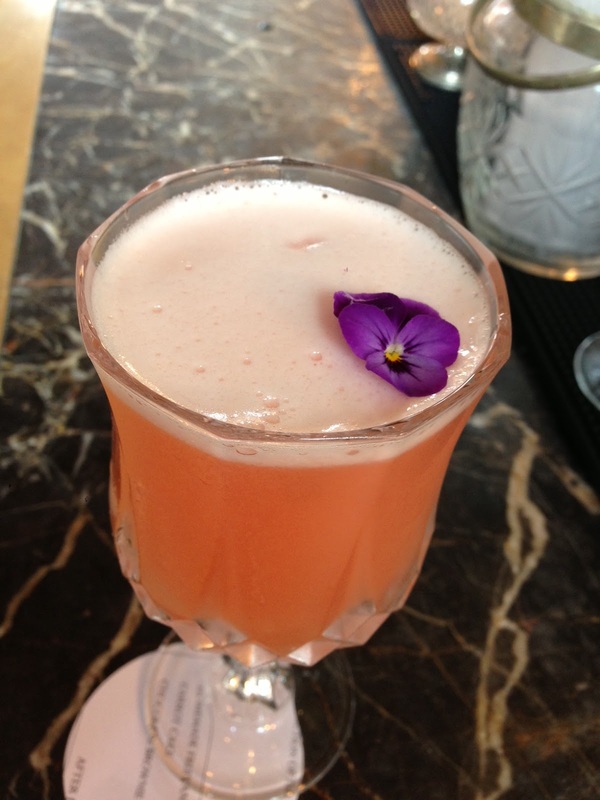 The bar at the Gilbert Scott is one of those. GrubsterGirl and I had eaten brunch in the restaurant already – and sampled the bar's creations as well – but we were there strictly on a reconnaissance, so it made sense to hit the bar and see what they were made of. 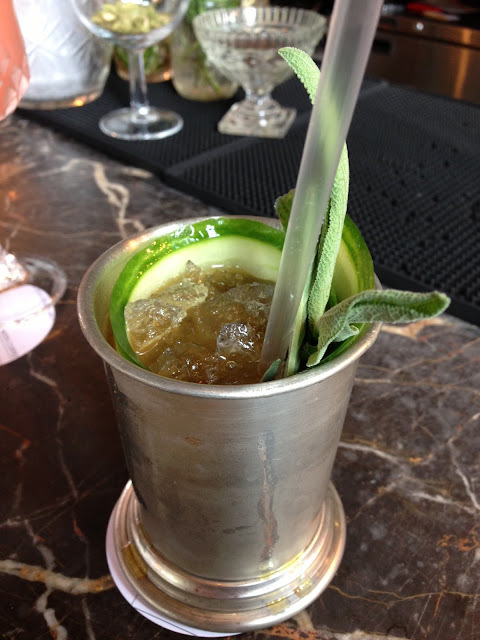 Proceedings began with the Guilia's Julep, a tempting mix of Woodford Reserve bourbon, mint, lime, Fernet Branca, Cynar, cucumber, sage and ginger. Essentially, an ultra-pimped version of the classic mint julep. I'm a massive fan of bourbon (and the julep, for that matter) so it was a bit of a no-brainer. What, quite simply, could there possibly be not to like? Well, quite a lot, as it turned out. Sadly, this is one of those drinks that shoots for the moon and not so much ends up in the stars as fizzles out and goes phutt. There's simply too much in there, too many flavours, which leaves your taste buds a complete mess by the time you're done. This is pretty much their signature drink, but it probably shouldn’t be: I wouldn’t go telling too many people about this if I owned the bar. GrubsterGirl chose more wisely with her opening salvo, going for a Rhubarb and Ginger Sour with tequila – a choice given to the consumer, the alternative being vodka. This was an absolutely fantastic little mix; all the right flavours in the right places, very satisfying indeed. Round 2: For me, an Amber Embers – Campfire infused scotch, apricot and vermouth. Yes, another whiskey cocktail, what can I say. 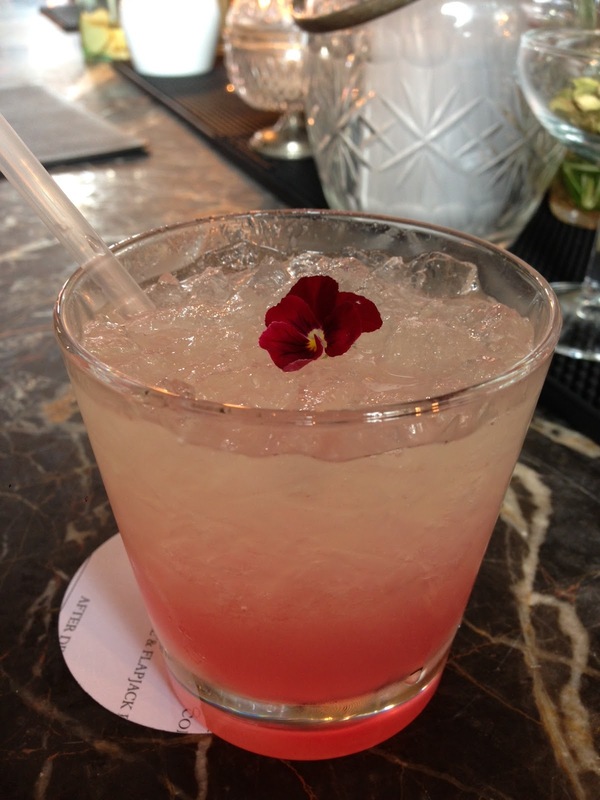 Suddenly, The Gilbert Scott had raised its game. This was magnificent, full of all the smoke, salt, thump and power it promised. Sure, it's not much to look at - especially considering the other efforts made on the presentation front - but I had to physically restrain myself from gulping. GrubsterGirl's second choice was the Hibiscus and Chamomile Caipirinha. Cachaça (the core ingredient of any Caipirinha) has a strong, distinctive flavour which needs some punchy flavours to be heard above the noise, so I worried that hibiscus and chamomile might be lost. I needn't have been worried about the hibiscus, which shone through, but I was slightly less impressed by the chamomile – by which I mean, where was it? When matched to GG's first cup, this one was a bit off the mark. The bar itself is opulent, in that mid-Century New York way that Campbell Apartments is. We were there during the day, but by night I can imagine it's quite fantastic. In fact, the only part I wouldn’t venture into is the garden – which is a shame, but it's situated right on the main road, so traffic just pours by. And the damage? Hefty. Four drinks and semi-mandatory service set us back over £60, which is more than you want, really. 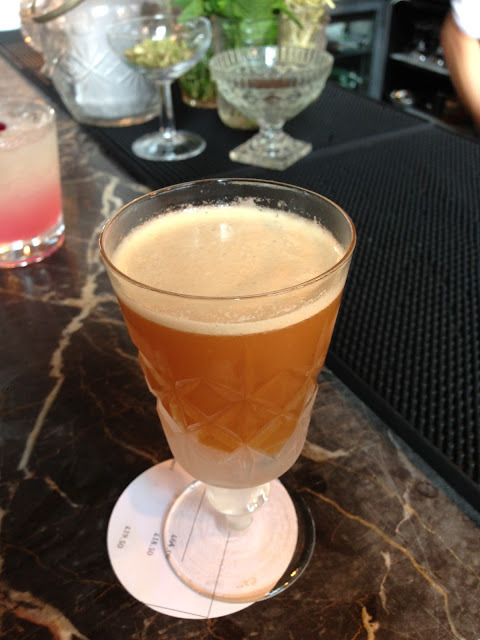 We started going to nice bars after a drink at the Savoy's American bar, which charges roughly £15 a drink – which is more expensive, but the drinks are flawless. More in their league (and price range), and style, are Hawksmoor's many bars. But then, their drinks are also pretty damn flawless. Oh, one other thing. Whilst we there there, sat up at the bar, the barman brought out a bag of greengages he'd sourced from some local market and set about inventing a new drink - quite unselfconsciously. Now, I imagine that that's part of your trade, as a cocktail barman, but there's something magical about watching the creation and experimentation process, and it's great - and reassuring - to see someone at work who takes their job seriously enough to be doing that.